Michelangelo's frescoes on the ceiling of The Sistine chapel are considered some of the greatest examples of Renaissance painting. There are over 300 figures depicting the stories from the book of Genesis. The series begins at the door with Noah and ends with the separation of Light from Darkness. 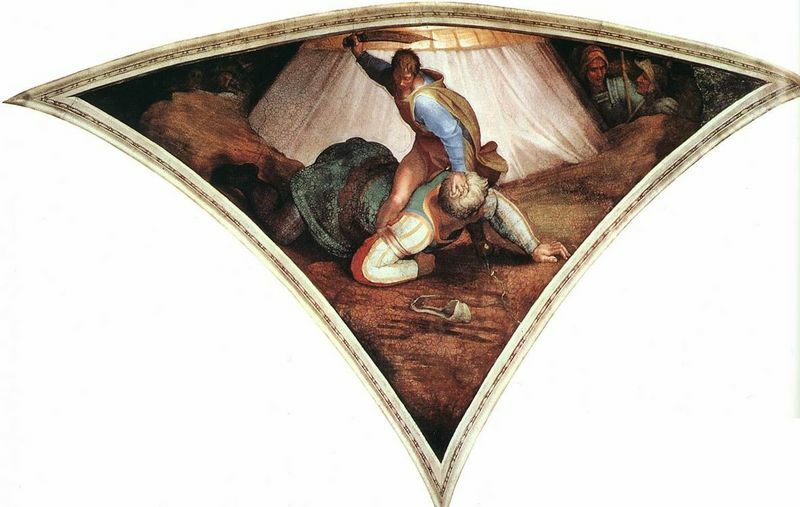 The reason for the inversion of the painting was not noted in any of Michelangelo's pieces. 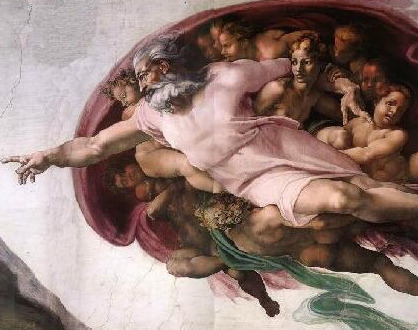 The artist's image of God reaching out to Adam is iconic and has been reproduced countless times. The celing took four years to complete and Michelangelo declared that his health was never the same again after craning his neck upwards. The bright colors of the frescoes were only recently restored when a team of renovators removed centuries of soot and grime from the ceiling. The ceiling of The Sistine Chapel is broken into 33 separate areas and each individual space has been painted with a different scene. In the central nine panels Michelangelo has painted the story of Genesis and they immediately capture the eye of the viewer entering the Sistine Chapel. 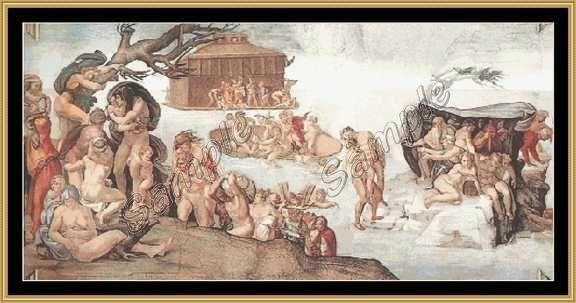 In the first panel Noah can be seen reclining, drunk, with his family surrounding him. 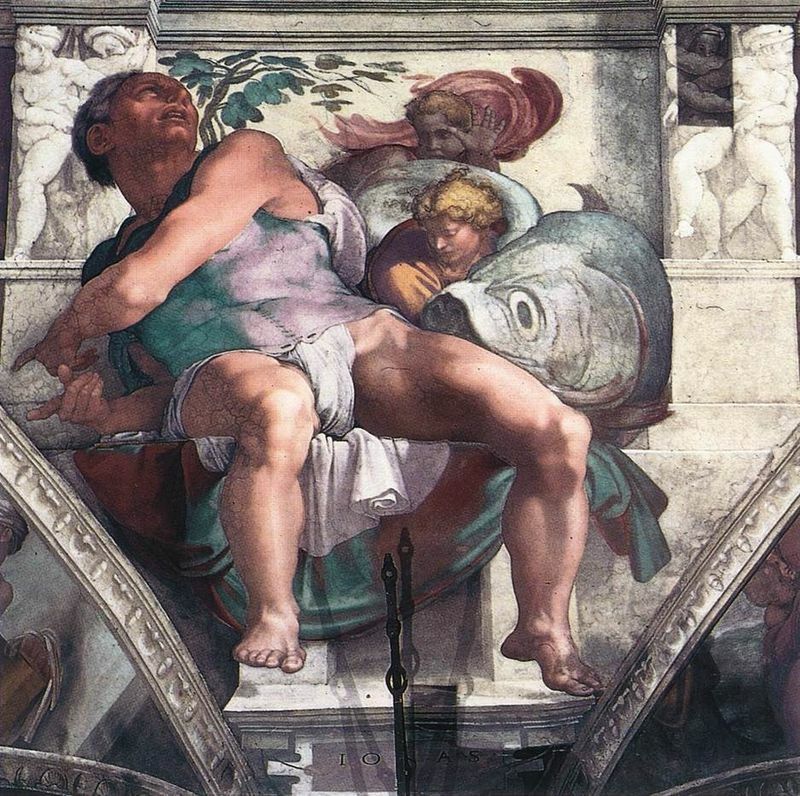 Michelangelo chose to reveal the weakness of the one man that God had chosen to save of the human race. In the second panel is the story of the Deluge. It is a chaotic scene with people attempting to save their lives on the only two rocks that have remained above the low water levels. Noah's ark can be seen floating into the horizon in the background. The third panel shows the sacrifice of Noah and reveals Noah thanking the Lord for saving his life. The forth panel shows the fall of Adam and Eve. They are accepting the apple from the serpent before being expelled from the Garden of Eden. This panel is followed (or preceded) by the creation of Eve, who in Michelangelo's picture, was made from a rock rather than Adam's rib. Subsequently the sixth panel displays the iconic image of Adam reaching out to God, who has just created him. This is a picture that has been reproduced by many and remains an iconic piece of art today. In the two panels before God created Adam, the Lord is seen separating the water from the land and creating the sun, moon and plants. The panel closest to the altar reveals God separating the light from the darkness. In the triangular areas on either side of the central panels are the ancestors of Christ. Solomon, Josiah, Jesse, Rehoboam, Asa, Uzziah, Hezekiah, and Zerubbabel are in the seven panels that surround the story of Genesis. The seven prophets and five sibyls are placed in the square panels between the ancestors of Christ. All of the prophets are represented - Jonah, Jeremiah, Daniel, Ezekial, Isaiah, Joel, and Zechariah - and they are all shown interacting with others. Finally, taking the space of the four corners of the ceiling of are four scenes from the Old Testament. In the triangles are the images of David and Goliath, the worship of the Brazen Serpent, the punishment of Haman, and Judith and Holofernes. 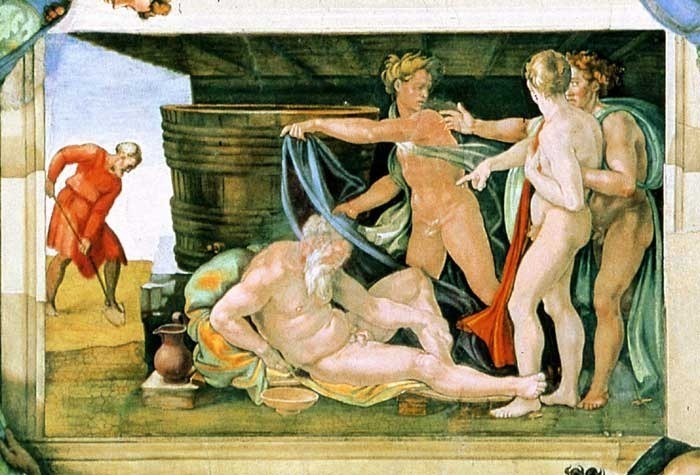 The figures in the second section of the ceiling that Michelangelo completed are much grander than those in the first (near to Noah's drunkenness). Michelangelo had removed the scaffolding to have a look at the work he had completed until that point and had been unsatisfied by the scale of the frescoes. This is why the prophets and sibyls nearest to the entrance have space around them, whereas those nearest to the altar fill the whole of their panels. Prior to the most recent restoration of the Sistine Chapel the colors of Michelangelo's frescoes had been dull, dark shades. After years of acquiring soot and grime from the coal fire the paintings had become a low-key, brown tone. However the cleaning removed the coal dust and the ceiling was once again the bright hue that Michelangelo had originally intended. The golden yellows, royal blues and dusky pinks all stand out against egg shell whites and pale salmons. God is leaning out to Adam in a pink carriage, held aloft by wingless angels. The skintones of the figures are pale peach and the robes are painted with pale pastels. God's full head of hair and thick beard has been painted with pale whites, grays, and small amounts of dark blue. His muscular body radiates power and beauty. The simple white tunic is at odds with traditional pomp and glory previous painters had dressed the Almighty in. Michelangelo's frescoes are very lightly lit and the bright, brash tones stand out against pale creams and pastel colors. In the representation of God giving life to Adam Michelangelo has filled the scene with white, fluffy clouds. Subsequently, in the very next panel where he creates the sun, moon and plants there is a golden, glowing ball lighting the whole image. In the surrounding panels the figures are sat on bright, white marble seats. 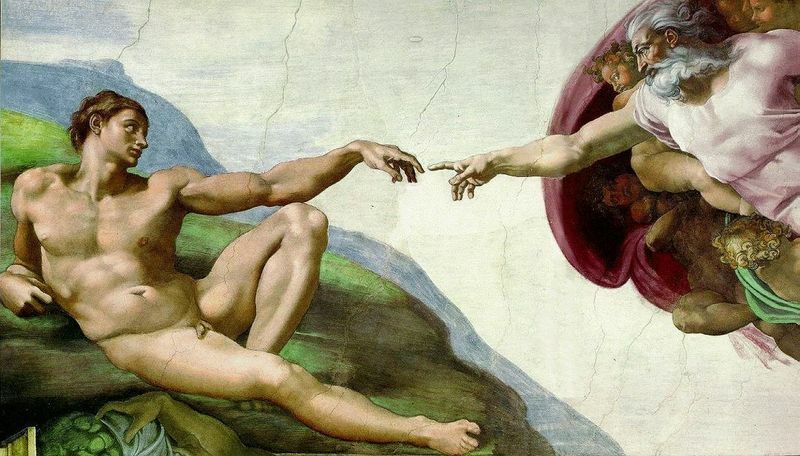 Michelangelo was a deeply religious man who frequently worked for the church. A strict Catholic the tone of much of his work is clearly spiritual. The ceiling of the Sistine Chapel tells the story of the book of Genesis and has images of the family and prophets of Christ. 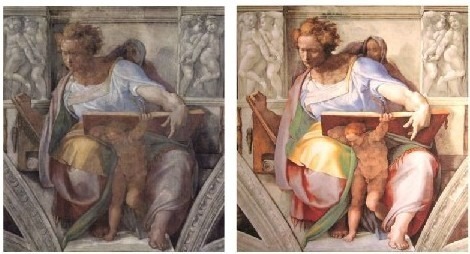 The sacred tone of the ceiling, with the images from the Bible, only augments Michelangelo's reputation as a profoundly pious man. Much of the artwork is moving, with images of disasters and love such as the story of the Deluge. In amongst the images of the people attempting to save themselves is the image of a father holding his drowned son. Both God's retribution and love are evenly represented in Michelangelo's frescoes.